Cartograms are maps in which the sizes of areas (such as states or countries) have been distorted to reflect some numerical value applying to that area. They are a form of topological transformation. To help make the end-product recognizable, the positions of major places are kept as close to their conventional spatial arrangement as possible. Drawing such maps used to be a very time-consuming and trial-and-error process. Only in the last decade or so has it become possible to make such maps using sophisticated computer programs. The most famous cartograms produced to date have emerged from the work of a team at the University of Sheffield in the UK. Their main website includes some fascinating examples of world cartograms portraying everything from tornadoes to tractors and nurses to national savings. The Sheffield team have also produced population cartograms for individual countries, which offer a unique visualization of population distribution. 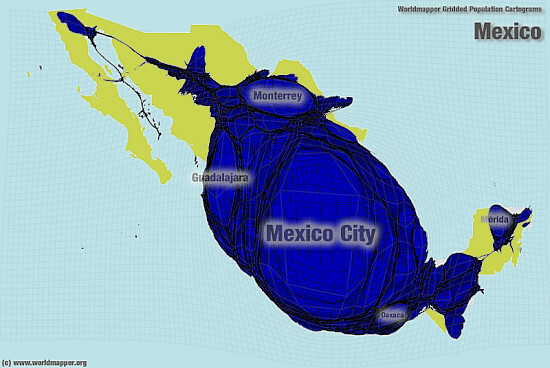 Cartogram of Mexico's population. © Copyright 2009 SASI Group (University of Sheffield). Used under Creative Commons Licence. The original cartogram on its original page (a somewhat larger image). The cartogram offers a striking image of the dominance of Mexico’s three main cities—Mexico City, Guadalajara and Monterrey—and their surrounding areas in the nationwide distribution of population.